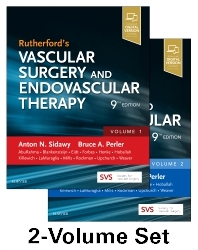 Through nine outstanding editions, Rutherford's Vascular Surgery and Endovascular Therapy has been the gold standard text in this fast-changing, complex field. Published in association with the Society for Vascular Surgery, this state-of-the-art reference by Drs. Anton N. Sidawy and Bruce A. Perler is a must-have for vascular surgeons, interventionalists, vascular medicine specialists, and trainees, as well as general surgeons, interventional radiologists, and cardiologists that depend upon "Rutherford’s" in their practice. It offers authoritative guidance from the most respected and innovative global thought leaders and clinical and basic science experts in the diagnosis and treatment of circulatory disease.